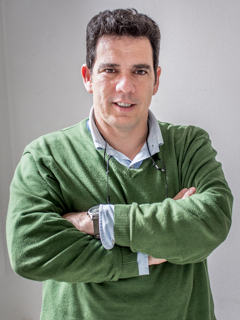 Dr. Rui Oliveira (born 22.02.1966), Ph.D. 1996 (University of Lisbon), habilitation 2004 (University of Algarve) Assistant Professor in Biological Sciences 1996 (ISPA, Lisboa), Associate Professor in Biological Sciences 2001 (ISPA, Lisboa), Full Professor in Psychobiology 2007 (ISPA, Lisbon), Principal Investigator at the Gulbenkian Science Institute 2012 (IGC, Oeiras) and Adjunct Faculty of the Champalimaud Neuroscience Program 2007 (CNP, Lisboa). Key qualifications in the field of Animal Behaviour and Cognition, Neuroendocrinology and Genomics. During the last years he has been involved in research within the field of behavioural neuroendocrinology and behavioural genomics. Main fields of interests are (1) the neuroendocrinology and genomics of social behaviour, (2) the evolution and mechanisms underlying behavioural plasticity (including alternative mating tactics), and (3) comparative social cognition. He leads a research group of 3 post-docs, 5 Ph.D. students, 2 lab technicians and variable numbers of M.Sc. and undergraduate students. He has experience in teaching (Neuroscience and Behaviour courses to Psychology undergraduate and Master students and advanced Neuroscience and Behaviour topics for the Gulbenkian and Champalimaud Ph.D. Programmes), supervising, refereeing and evaluation of scientific research (e.g. member of the European Research Council experts panel for the evaluation of research proposals, ad-hoc reviewer for NSF and NIH Programs). He is the Director of the Post-Graduate Program in Psychobiology at ISPA. He is also the coordinator of three ongoing research grants at the national level and participates in two international research networks (FP7 in Europe and CNPq in Brazil). He is the past President of the Portuguese Ethological Society (SPE) and was the founder Chief-Editor of the journal Acta Ethologica (Springer-Verlag). He served as Associate Editor of the journals Hormones and Behavior, and Animal Behaviour (Elsevier) and acted as Guest Editor for a thematic issue at Frontiers in Behavioral Neuroscience. Currently he is the Dean of ISPA. He has published over 180 research papers in international peer-reviewed journals, and edited 2 books. Oliveira, R.F., Simoes, J.M., Teles, M.C., Oliveira, C.R., Becker, J.D. and Lopes, J.S. 2016. Assessment of fight outcome is needed to activate socially driven transcriptional changes in the zebrafish brain. Proceedings of the National Academy of Sciences USA 113: E654-661. Teles, M.C., Almeida, O., Lopes, J.S. and Oliveira, R.F. 2015. Social interactions elicit rapid shifts in functional connectivity in the social decision-making network of zebrafish. Proceedings Royal Society B 282: 20151099. Soares, M.C., Oliveira, R.F., Ros, A.F.H., Grutter, A.S. and Bshary, R. 2011. Tactile stimulation lowers stress in fish. Nature Communications 2: 534. Antunes, R.A. and Oliveira, R.F. 2009. Hormonal anticipation of territorial challenges in cichlid fish. Proceedings of the National Academy of Sciences USA 106: 15985-15989. Oliveira, R.F., Carneiro, L.A. and Canário, A.V.M. 2005. No hormonal response in tied fights. Nature 437: 207-208.